Featuring an easy-to-access, highly visual approach, Atlas of Vascular Surgery and Endovascular Therapy offers the comprehensive, step-by-step guidance you need to achieve optimal outcomes in the treatment of venous disorders. 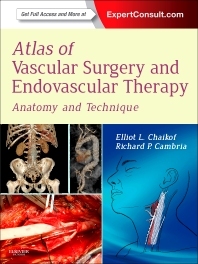 Covering the full range of diseases/disorders most important to vascular surgeons, this full-color, one-volume, atlas presents over 100 common and complex procedures, including open and endovascular techniques, with an emphasis on anatomy and imaging studies as they apply to each technique. Know what to do and expect with comprehensive coverage of almost every procedure you might need to perform. Review key techniques prior to performing surgery. Clinical images and 37 real-time video clips capture key moments in procedures including: surgical repair of a suprarenal aortic aneurysm; surgical repair of thoracoabdominal aortic aneurysm; endovascular treatment of aneurysms of the juxtarenal and pararenal aorta; surgical exposure and harvest of the femoropopliteal vein; and endovascular treatment of aortic arch vessels, subclavian and axillary artery. Visualize every procedure thanks to more than 1,000 full-color illustrations; including procedural photos and beautifully illustrated drawings that highlight the relevant anatomy and techniques in specific treatments. Prevent and plan for complications prior to a procedure thanks to a step-by-step approach to each procedure accompanied by relevant imaging studies. Glean all essential, up-to-date, need-to-know information about hot topics including: management of peripheral arterial disease; aortic aneurysms/aortic dissection; lower extremities/critical limb ischemia; and infra-inguinal occlusive disease. Access the fully searchable contents of the book and procedural videos online at Expert Consult.